2010 March « ¡AWW YEAH! First thing I feel like I need to note is I am not a parent. Not even close. I am the oldest of five siblings. There is a 302% chance you know more about raising children than I do. So please don’t get mad if I make declarative statements that are completely wrong. In fact, just correct me and hopefully I’ll be smarter for it by the time I have kids (which honestly may be never). Declarative statement #1: One of the most effective ways to get your kids to read is by finding literature they’re interested in. There are books on everything. Everything. Now finding comics on that stuff is a little trickier, but it can be done. The way things are looking today, if you can buy a toy for it you may be able to find a comic about it. I know in my experience that’s one of the biggest barriers to entry. My little brother will read star wars books or sports books, but little else. I’ve tried a bunch of different kinds of books that would seem to me like something he’d like but they’re not his wheelhouse and reading those was a struggle. Know what? I’m going to just publish this now and come back tomorrow (yay spring break! I can actually post stuff!) and write more on this. I’ll give actual recommendations and actual advice on how to find comics someone might actually want to read. I think I’m one of a small group of people that publicly enjoys cars, but I’m just not sure this book is for me. I don’t know who the book is written for other than kids that play with hot wheels. If that’s in your wheelhouse then I’m sure this will work as an extension of your playtime, otherwise, I’ll recommend passing on this. I think this book is getting better. It is still divisive amongst long time fans of the Muppets. Some people don’t mind the art, some abhor it. The short sketches are quite funny, but the overall story lines are hit or miss. This issue promises lots of Statler and Waldorf so I’m in. I am in love with “Not Really” Buzz Lightyear. This story continues in adventures with him and finding the real one. Can’t wait to see how this goes down. I’m really not certain how Boom is going to handle the collections of these issues, but if it’s not a rip off or just all around not good I’ll say try to pick it up. I’m still excited about this story. All I know is Mickey had a robot and a bunch of people got kidnapped. Looks dangerous. This week really belongs to this book. I can’t say enough good words about this title and how much fun it is. If you haven’t picked up their first adventure the paperback comes out in May, or you can try the Hardcover. I’m usually not big on Hardcovers, too expensive for my blood, but some people swear by the ability to wipe water off quickly without doing too much damage to the book. Anyway, this single book is only (yes yes I know) $2.99 which is infinitely more palatable than the $3.99 special a few months back. Bah. THE NOT QUITE FINAL ISSUE! It’s sort of final, but remember, the book is being relaunched in April with a brand new #1 for you to collect! YAY! (The Yay is sarcasm). 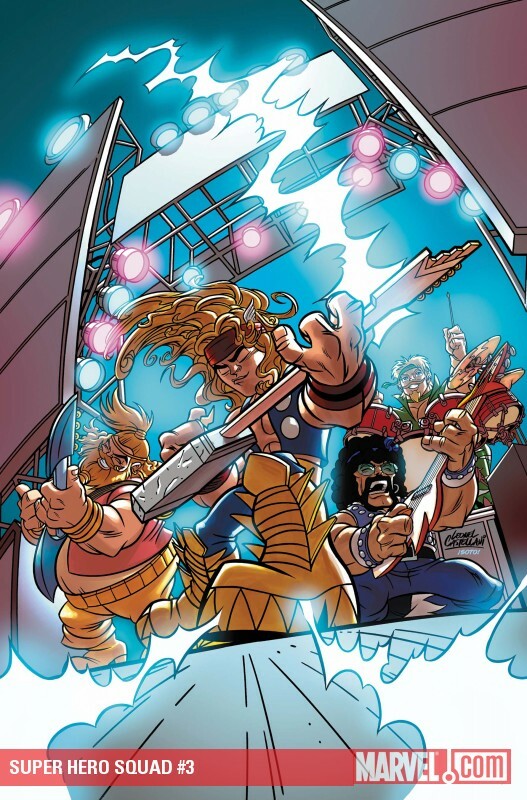 I don’t know what’s going on in the issue but the cover has Thor and the Warriors 3 in a hair metal band. I know I know, can’t judge a book by it’s cover, but I’m going to do that here. This may be the best book you ever read (that’s hyperbole).